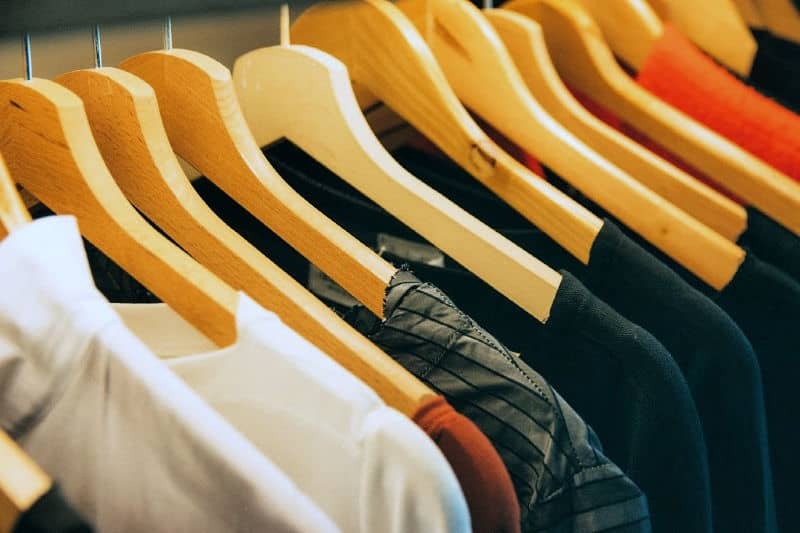 As you probably know from looking in your own bedroom closet, adults tend to hold onto a lot more clothing than kids do. After all, we aren’t growing several inches taller each year, and don’t often wear holes in the knees or elbows of our clothes while playing hard. That’s why our closets get crammed full of stuff — much of which we never wear and some of which we’ve completely forgotten about. So, today we’re going to focus on organizing bedroom closets to eliminate the excess and make our closets easier to use. 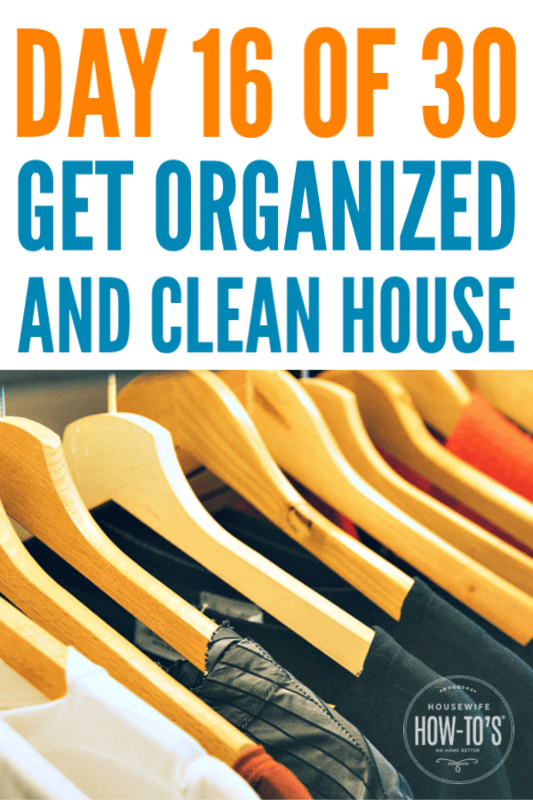 If you’re just discovering this site or plan, please read the overview for this free 30-day series to get an organized and clean home. You’ll find links to previous days’ missions there, too. So, let’s get started organizing bedroom closets by pulling everything out and moving it to your bed or the floor. Removing clutter takes making some honest decisions about the clothes in that third pile — the things we’re tempted to keep. As you make decisions, you might be tempted to try on things you haven’t worn in a while. Do not try on clothes while you’re decluttering your bedroom closet! If you can’t remember the last time you wore something, the chances are good it falls into one of the clutter categories below. After all, you’ve had one or more chances every single day to wear the thing but haven’t felt the need to — that’s proof enough that you don’t actually need it in your life. Resortwear when you haven’t taken a vacation in 10 years. Clothing for sports you don’t play anymore (or never have). 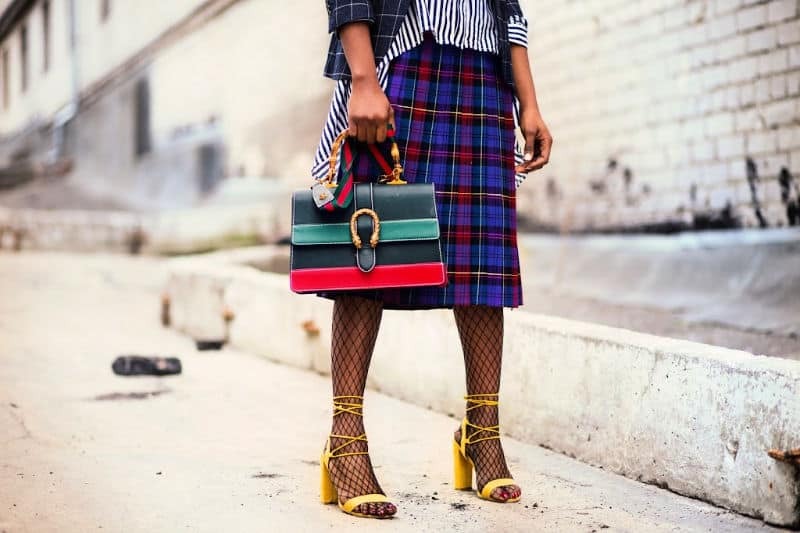 Style mistakes: We all occasionally fall for bad fashion trends, but don’t punish yourself by holding onto the proof. Other times, we buy clothes hoping to broaden our personal style but wind up never wearing them. Clothes that are more daring than you’re comfortable wearing. Outfits that feel like you’re pretending to be someone else, or have borrowed someone else’s clothes. Anything that makes you feel frumpy. Good stuff that feels bad: Sometimes, an outfit can look fantastic but we just don’t enjoy wearing it. Even if it’s your shade, you get compliments whenever you wear it, and you got it on sale, if it’s not pleasant to wear, it’s clutter. Things that bind or constrict uncomfortably. Clothes which feel heavy or bulky, or make you sweat even in mild temperatures. Pants that ride up (or down). Anything that doesn’t flatter our figures. The money objection: It can feel wasteful getting rid of clothing we paid good money for, or which someone gave us. But that money has already been spent. Holding onto that piece of clothing won’t earn it back. If you feel like something’s worth too much to donate, list it on eBay or Craigslist — or see if there’s a consignment shop in your area willing to sell it for you. But get it out of your closet now. Organizing bedroom closets is much easier if you’ve been strictly honest when deciding which clothes are clutter. By this point, your donation pile should have grown while the pile of things you are keeping should be more manageable. Out-of-season clothes shouldn’t take up space in your closet. Make sure they’re clean, then box them up until next season. (See How to Store Winter Clothing.) If you simply do not have anywhere else to store them, hang them to one side of the closet where you won’t have to flip through them to get dressed each day. Clothes that don’t fit are a form of “Someday Stuff,” whether they’re too big because you’ve lost weight or too small because you’ve gained. Maternity clothes if you aren’t currently pregnant fall into this category, too. Note: If you’re working to gain/lose weight, or to get pregnant, box up these things and move them to wherever you store stuff. Put a date on the box while you’re at it. If you haven’t opened that box within a year, haul it to the thrift shop! Clean your closet while it’s empty. That means dusting everything from top to bottom: ceiling, shelves, rod, walls, inside the door, and the baseboards. Wipe the light fixture, doorknob, and light switches with a damp microfiber cloth. Use another damp cloth on the shelves. Then clean the floor. Put clothes away by category: (jackets, shirts/blouses, pants, etc.) Hang longer items like dresses or skirts toward the ends of the closet rod so they don’t block your view of other clothes. Put your shoes back. On the floor is fine, but using an over-the-door mesh holder keeps them tidier and easier to find. Put accessories away. Hang scarves over the bar of a clothes hanger. Loop belt buckles over another clothes hanger. They also make special hangers with loops to hold scarves, ties, or belts — they work great! Store purses and handbags on a shelf. Make sure they’re empty, so they’re ready to use. 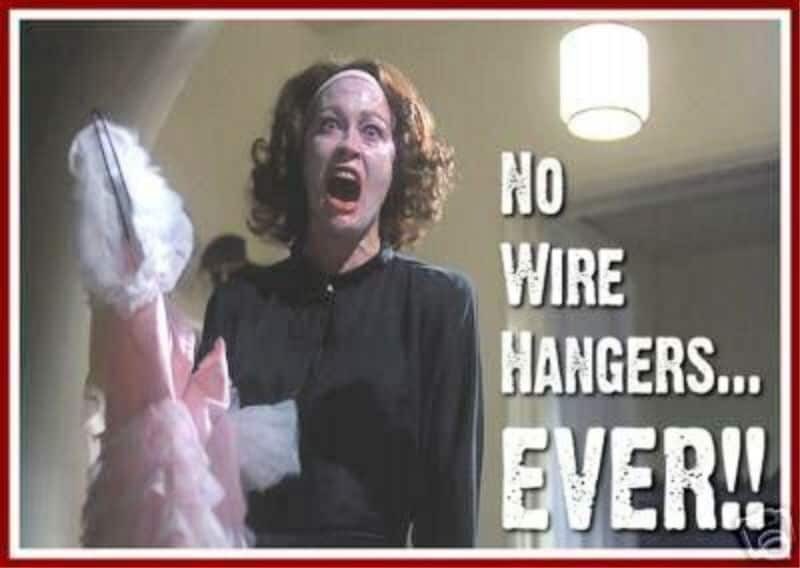 If you find your closet still looks messy, the reason may be wire hangers. Personally, I hate them: clothes slip off, and they leave creases on shoulders. One of my best closet investments was this 100-pack of velvet hangers that about the same as the plastic ones — but they’re non-slip! So, buzz through the following areas, throwing away trash and grabbing anything that’s out of place. This takes 10-15 minutes altogether, but keeps your home looking like you just cleaned. Entryway and coat closet: Make sure everything is hung up and shoes aren’t collecting by the door. Dining table: Give it a quick wipe. Kitchen: Put away things that belong in the cupboards. Wipe the counters. Family room/living room: Straighten pillows and the stuff on tables. Bathrooms: Wipe sink faucets and basins, toilet seats, and toilet rims. Kids’ rooms: Have them put away clothes and toys that are out of place. Your dresser: Put away things you’ve decided don’t need to hang in the closet. Don’t forget those boxes! Take your box of clothing donations to your car now, so you can drop it off next time you’re running errands. Move the other boxes to storage, and throw away that bag of trash. We’ll be ROCKing your bathroom for Day 17’s mission. In the meantime, come join our Do Home Better Group on Facebook and show off your closet transformations!